The following is an excerpt of an op-ed by GMO Answers expert Michelle Miller, also known as the Farm Babe, on the Ag Daily website addressing a popular myth that only large agribusinesses work on developing GMO crops. Last month, I delivered a speech in Dublin at the International Association for Plant Biotechnology conference. The event occurs once every four years and brings some of the top plant scientists and experts in plant breeding from around the world together for an amazing symposium. As a farmer, I was there to tell the story from our perspective, of how biotechnology has helped us on our farm — we can grow more crop on less land with less chemicals, tillage, and natural resources thanks to “GMO” technology. These are just a few important examples. 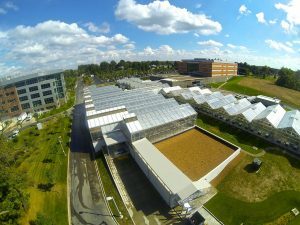 After having a chat with Dr. Nigel Taylor and Dr. Dilip Shah, I was very excited to be invited to the world’s largest independent plant research center called the Donald Danforth Plant Science Center in St Louis. And, boy, is it impressive! First off … I think it’s a popular myth that only large agribusinesses work on developing GMO crops. This center is completely independent from all large agribusiness companies. 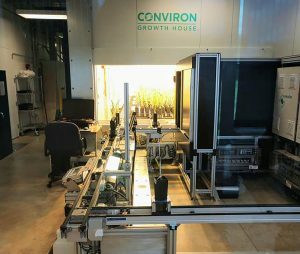 There are hundreds of researchers; some from startups, some from smaller companies, some greenhouse space can be leased or rented to the “little guys” in the plant breeding arena to make it more affordable for them. Very cool. So, what about these problems mentioned above? Climate change is very real. What if, decades from now, our climate is so far changed that certain crops can no longer be grown in their respective regions? This is where science comes in with answers. At this research center, they’re breeding crops for drought tolerance. They’re looking to utilize crops like sorghum for sources of bioenergy. 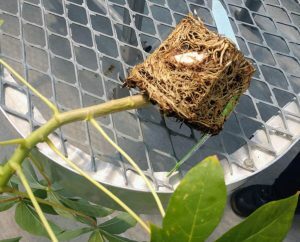 They’re studying why some plants use water more efficiently than others. 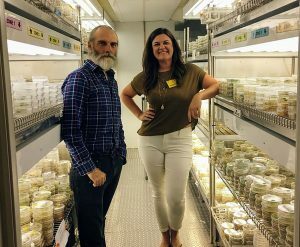 They’re taking thousands of data points, developing new cover crops, investigating carbon dioxide levels within the plant biotech sector, and doing field trials in subsaharan Africa to breed staple foods with more nutrients, among other things. And this was the part I probably found the most interesting. Behold! I’m in a lab full of GMOs! This is a photo with Dr. Nigel Taylor who leads the Virus Resistant Cassava for Africa (VIRCA) project and told me how approximately three-fourths of the African population are farming. Cassava is one of the most widely consumed foods in Uganda and Kenya, but the problem is that it’s currently being decimated by brown streak virus. So, what they’re doing is creating a variety of it that recognizes the pathogen as a normal part of plant health so it’s not affected by the disease. Think of it almost like a vaccine. Cassava is a staple food “root” crop that contains a lot of starch but is low in other nutrients like iron and zinc. Since this food is the most important source of calories for this region, wouldn’t it be nice if it was much more nutritious? This is another aspect of improving the crop for farmers to grow and people to eat. 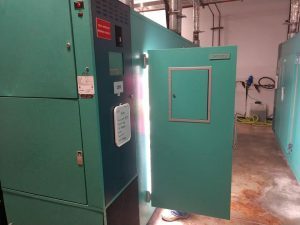 Here’s another really cool aspect of the Donald Danforth Plant Science Center: The site has created research rooms that mimic what it’s like in other parts of the world. For example, this room may simulate what it’s like in Uganda — same climate, soil type, rainfall, etc. Neat, eh? And they’re doing just that. Let’s connect with these scientists and celebrate all the work they’re doing to help humanity. With these brilliant (and generally underappreciated) research endeavors, the future of the planet looks much brighter. To read the entire article, please visit the Ag Daily website.